How many times, have you received Email from an unknown person. The email could be about anything like threatening, a TIP, suggestion and for personal stuff. Sometime it’s important to find the location of the Email sender to make a wild guess about who this anonymous Email sender is. 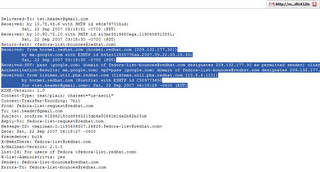 In this tutorial, I’m sharing how you can trace sender IP address in Gmail with simple steps. That’s The I.P. of The sender. Now to trace the sender using this up. Open this site http://network-tools.com/ . Select option as trace and enter the I.P address of sender which we have found in above steps. In the next window, you will see the details of the user. That’s it, and now you have an idea about the location of the sender.